Determined to shape his legacy in Iraq, President Bush has cut Congress out of his negotiations with the al-Maliki government. Despite repeated requests, the Administration has refused to share with congressional committees the text of its negotiating draft, even on a confidential basis. But elements of the proposals under negotiation have steadily leaked out from the Iraqi side, and now an Arabic-language newspaper, Asharq Al-Awsat, has published what it says is the full draft agreement. The draft agreement published by Asharq Al-Awsat would clearly contravene the U.S. Constitution. It would not be a treaty, requiring the consent of two-thirds of the Senate, or a congressional-executive agreement, requiring the approval of both houses of Congress. Instead, the President would assert his power as Commander in Chief to commit the nation to his deal with Iraq without seeking the consent of the legislative branch. The provisions of the published text, however, decisively refute his claim to unilateral authority. The breadth of the President's powers as Commander in Chief is one of the most controversial issues in constitutional law. Nevertheless, there is one point on which everybody agrees: The President can't unilaterally surrender his command over the military to somebody else and tell the troops to treat this outsider as Commander in Chief. The authority he has as Commander in Chief is not his to transfer. The published draft agreement violates this bedrock principle by creating a joint U.S.-Iraq committee and giving it, not the President, the authority to coordinate military operations, resolve operational disputes and even "determine the tasks and level of the troops that will focus on training and supporting Iraqi security forces." The agreement creates only one exception: American troops can act unilaterally in self-defense without obtaining the committee's permission. All this may or may not make sense, but it is up to Congress to decide. There have been occasions when foreigners have been given some control over American troops in connection with NATO and U.N. peacekeeping operations. But these delegations of command authority occurred under treaties ratified by two-thirds of the Senate, not by presidential fiat. Worse still, the agreement would govern military relationships well into the next Administration. 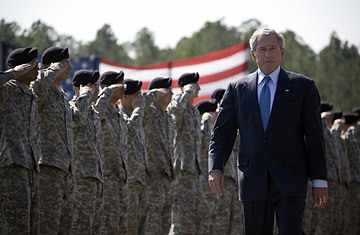 President Bush is proposing to give away not only his own powers as Commander in Chief but also those of his successor. The published draft agreement also usurps congressional power over the Treasury. It obligates the United States to pay for the construction and modification of military installations that will revert to Iraqi ownership when U.S. troops leave. This is an open-ended commitment that goes beyond the funds already appropriated by Congress. By taking this step, the President seeks to remove the most fundamental check on the abuse of executive power  the power of the purse. The reason the questions of authority over future U.S. military operations in Iraq have not received the attention they deserve is simple: the Administration has cut Congress and the American people out of the loop. The media discussion of the negotiations between the Iraqi and U.S. governments, fueled only by leaks, has focused on more sensational topics such as a timetable for withdrawal of American troops and the al-Maliki government's efforts to prosecute American contractors for crimes committed on Iraqi soil. These are important matters, which should also be submitted for congressional approval, but the precedents set by the President's unilateral use of power will have greater long-term consequences. It is past time for the President to provide Congress with a copy of the draft agreement and ask for its consent. Senators and Representatives should not be forced to rely on translations from foreign newspapers to learn what their government is up to; there should be no secret deals on the most important issues facing America. As chair of the Senate Foreign Relations Committee, Joe Biden has co-sponsored legislation demanding that the Administration submit the Iraq agreement for congressional approval. Now that he is the Democratic nominee for Vice President, he should take the initiative and reach out to Senator John McCain, who understands perfectly the questions of principle at stake. Both Democratic and Republican candidates should join together to make it clear that, whoever wins the election, the next President will put the Constitution first in his dealings with Congress. Ackerman and Hathaway are professors of law at Yale and the University of California, Berkeley, respectively.